Llandrindod Wells (Welsh: Llandrindod, lit. 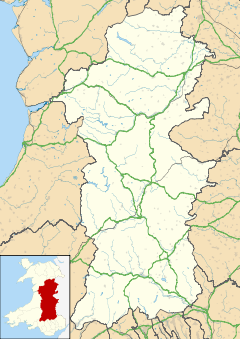 "Trinity Parish") is a town and community in Powys, within the historic boundaries of Radnorshire, Wales. It serves as the seat of Powys County Council and thus the administrative centre of Powys. It was developed as a spa town in the 19th century, with a boom in the late 20th century as a centre of local government. Before the 1860s the site of the town was common land in Llanfihangel Cefn-llys parish. Llandrindod Wells is the fifth largest town in Powys, and the largest in Radnorshire. During the mid-18th century the 'healing qualities' of the local spring waters attracted visitors to the area resulting in an economic boom with the building of a 'splendid' hotel at Llandrindod Hall. A period of relative decline during the late 18th and early 19th centuries was reversed with the construction of the Heart of Wales Line making Llandrindod accessible from the Midlands and North West of England, and South Wales. Enclosure of the common in 1862 enabled expansion of the town with the construction of new streets, hotels, shops and houses. During the 'season' between May and mid-September visitors would take the waters at the pump rooms at the Rock Park and Pump House Hotel, entertained by orchestras. Hotels, boarding houses and shops—including the Central Wales Emporium on the corner of Temple Street and Station Crescent—provided for the visitors. In the early 1870s an ornamental lake was formed by draining marshland near the Pump House Hotel (on the current site of the Council offices), and in 1893 a 9-hole golf course was opened on the common beside the lake (later replaced by the present 18-hole course on the hills above). Horse races (and later air displays) were held on the Rock Ddole meadow beside the river. In 1893 the archdeacon with responsibility for the area had Llandrindod old church and Cefnllys church unroofed in order to persuade the congregations to attend the new church in the centre of the town. In 1895 both churches were restored. Llandrindod was the place of the election of the first Archbishop of Wales, which occurred at the Old Parish Church. Elections for every Archbishop since have continued to be held in Llandrindod, now at Holy Trinity Church in the Town Centre. In 1907, a Catholic church was founded in the town, Our Lady of Ransom and the Holy Souls Church. The Town has maintained an important profile in the world of motoring and motor sport. Apart from two of its most symbolic recent buildings being the Tom Norton's Automobile Palace and Pritchard's Garage, it served as the base for many International motorcycle events such as the International Six Days Trial ISDT starting in 1933 with the last visit taking place in 1961, often drawing in crowds of thousands to watch. The Welsh International Two Day Trial organised by locals is still a popular event as well as many rallies which rely on the infrastructure of Llandrindod's Hotels and public spaces. The town's boom continued until the First World War during which time soldiers on training courses were billeted in hotels and boarding houses, and refugees and wounded soldiers were accommodated in the town. The depression of the late-1920s and 1930s led to many hotels and boarding houses being turned into private homes and flats. During the Second World War the town was again used for military hospitals and billets, followed by a slump in the post-war years. The Beeching Axe resulted in the closure in the mid-1960s of the Mid-Wales line and with it Llandrindod's connection from nearby Builth Wells direct to Cardiff in the south and to North and West Wales. The town does however retain connections to Swansea and Shrewsbury via its station on the Heart of Wales Line and the A483 road which is the main route through the town centre. Prior to 1974 the county housed much of the administration of the county of Radnorshire, although the official county town was Presteigne. The reorganisation of local government in 1974 resulted in Llandrindod becoming the county town of the newly formed administrative county of Powys. This led to an influx of people employed by the new bureaucracies, on salaries determined by national pay scales. With the relatively low cost of living in the area this resulted in a boom in the town's economy as the newcomers spent their money on housing and entertainment. In more recent years the economy has again flagged. Significant local industries, the town's carpet and stationery factories, closed, and many shops likewise. As in many such areas there are now some empty retail units and charity shops, including Oxfam and British Red Cross occupying premises once used by commercial enterprises. An open-air market is held once a week in County Council’s High Street Car Park and brings many visitors into the town. The town has larger business chains, including Tesco, Aldi, Spar, Greggs, Mica Hardware and a Post Office, as well as smaller businesses. In a 2018 survey undertaken by Rightmove, Llandrindod was voted the Happiest Place in Wales. A survey by the Royal Mail over the Easter 2018 period showed that Llandrindod had the highest online shopping rates for that period in the whole of the country. Three county electoral wards lie within the boundaries of the town which each elect a councillor to Powys County Council: Llandrindod East/West, Llandrindod North and Llandrindod South. Llandrindod Wells Town Council has up to 15 town councillors (elected from five community wards) and one clerk. The 2018 - 2019 Mayor was Cllr Jon Williams but, resigned 2 months prior to his end of term, amid bullying claims. In May 2017 Cllr Williams was also elected as county councillor for Llandrindod East/West. The architecture of the town includes many buildings in ornate styles dating from the boom period of the Victorian and Edwardian eras including the Metropole and the Glen Usk hotels, the Albert Hall theatre and County Council building adjacent to it. There are also buildings in the Art Deco style including two former garages, Pritchard's and the Automobile Palace. The latter was notable for a collection of antique bicycles owned by the proprietor, Tom Norton, which were displayed suspended from ceilings in the building. The building has in recent years been renovated and is now home to several small businesses and the National Cycle Collection, featuring some of the bicycles originally displayed in the garage. The largest of the town's hotels are the Metropole (with 120 bedrooms of 4 star standard, an indoor swimming pool and leisure centre), the Glen Usk and the Commodore. The Hotel Metropole's swimming pool used to be open-air and was open to the public when it was the only pool in the town, but a public pool is available now at the sports centre attached to the local comprehensive school. A hotel in the scenic Rock Park has not survived, and various cafes and restaurants have come and gone over the years leaving a handful of establishments currently operating. There ia a large man-made lake in the town used for fishing and model boating. The lake houses a sculpture of a water serpent and leaping carp, the scales of which are made of thousands of copper plates initialled by local people and visitors during construction of the work. Beside the lake, sits a distinctive tree-trunk sculpture known as a 'Llandoddie', one of many such sculptures distributed throughout the town. In May 2018, pedalo boats for hire were launched onto Llandrindod Lake, as part of a £158,000 regeneration project. The boats returned in 2019, after being supported by Powys County Council and Llandrindod Wells Town Council. An 18-hole golf course, established in 1905, features challenging topology and views over the lake, the town and surrounding countryside. The town has three international standard outdoor bowling greens dating from 1912 which hosts national and international events and has recently been voted ‘the best facilities in the whole of the British Isles’. A newer indoor bowling centre, can also be found in the centre of the town. Llandrindod Wells Victorian Festival, known locally as 'Victorian Week', at the end of August, brings many visitors to the town. Many locals and some visitors dress in Victorian, Edwardian or other antique costumes, and many of the town's shops and other high-street businesses dress their windows or otherwise join in the spirit of the event. The festival typically offers open-air and street theatre and music, a fairground, a craft fair, an historical re-enactment, entertainments at the Albert Hall and exhibitions of "things old-time". For 2015 and 2016 this grew into a weekend steampunk festival, first as part of the Victorian festival and then as an independent event, however, did not return in 2017. The town hosts annual Welsh 2 Day Enduro in June. This attracts motorbike riders from all over the UK and brings lots of tourism to the town. There is a wide range of entertainment available in the town each year. The Albert Hall Theatre is a Victorian Theatre owned by the community of Llandrindod. The Theatre is run by a group of volunteers and are beginning to host a range of events, suitable for all. Llandrindod Wells Theatre Company host their annual Pantomime and Summer Season Shows at the Albert Hall. Pavilion Mid Wales (formerly known as The Grand Pavilion) brings a wide range of entertainment to the town. Radnor Fringe Festival was an annual free festival held within the Rock Park. 3 days of Live Music, Comedy, Spoken Word, Dance, Children and Family Activities, Traders and much more. The festival originally ran alongside the already established Victorian Festival, however, it was decided to move the festival to its own weekend, and has gathered momentum and popularity in so doing. Sadly, the Festival is currently not planned to return for 2019. Llandrindod has two primary schools and one secondary school. Llandrindod Wells CP School - Cefnllys (Ysgol Cefnllys) is an English Medium Local Authority Primary school. Llandrindod Wells Church in Wales School - Ysgol Trefonnen is an English and Welsh Medium Local Authority Primary School. Ysgol Calon Cymru is the town's Local Authority secondary school. The school has two campuses, which replaced the former Llandrindod High School (and Builth Wells High School) and opened in September 2018. The Llandrindod site provides an English-medium education for 11 to 18 year olds. ^ "Town population 2011". Retrieved 11 November 2015. ^ Wilson, Chris. Around Llandrindod Wells. The Chalford Publishing Company Limited. ISBN 0-7524-0191-2. ^ "Your Councillors". Llandrindod Wells Town Council. Retrieved 17 September 2018. ^ Ariane Brumwell (20 March 2019). "The Mayor of Llandrindod Wells has stepped down". The Brecon and Radnor Express. Retrieved 14 April 2019. ^ Owain Farrington (11 May 2017). "Llandrindod Mayor on county council and Lib Dems take South". Powys County Times. Retrieved 17 September 2018. ^ Llandoddie in a BBC article. ^ Mike Sheridan (16 May 2018). "Completion of regeneration works to breathe new life into Llandrindod Wells boating lake". Powys County Times. Retrieved 17 September 2018. ^ Victorian Festival - official site. ^ Anwen Parry (6 September 2018). "Ysgol Calon Cymru: Hundreds of pupils start back at Powys' newest school". Powys County Times. Retrieved 14 January 2019. Wikimedia Commons has media related to Llandrindod Wells. New Town Website launched in 2016 by The Town Champion and Town Council. It contains The Town Council Website, Information about the Town and Businesses and Photos of the town. Llandrindod Wells Town Council Llandrindod Wells Town Council.